This beautiful Cashmere throw will enhance any living space with cosseting comfort. Being thickly woven of the longest cashmere fibres means more warmth, more softness, and more durability so you know you'll cherish it for years. These classic and fabulous throws are made with the highest grade of 100% Certified Cashmere. Perfect for use at home and while traveling. 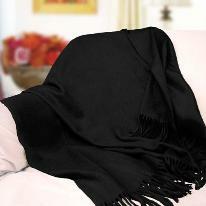 Material: 100% Certified Cashmere Product Dimensions: 50" x 60"